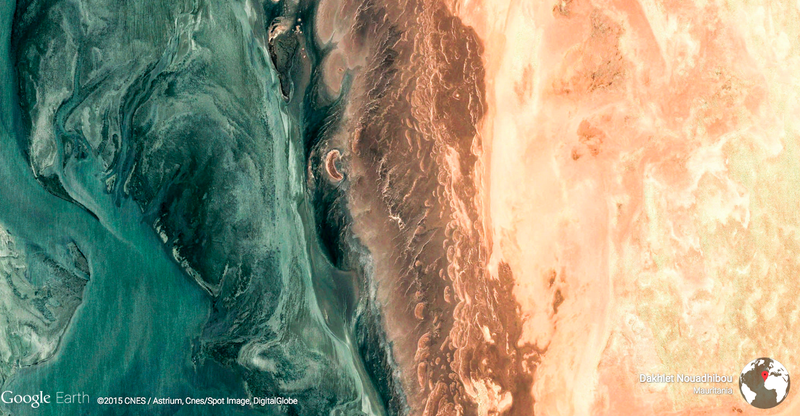 Google Earth celebrated its tenth birthday yesterday, and to celebrate, the engineering team added 1,500 new images to its great Earth View project, where it collects the most compelling images recorded by its source satellites. The project, which apparently started out as a “20 percent” project of some Earth engineers, not has its own web gallery to go along with the Chrome extension we wrote about last fall. Of course, Google Earth isn’t just beautiful images–it’s remarkable for the sheer breadth of ways it’s impacted the way the world works, from inspiring anthropological and geological insights (see world’s best preserved crater, rampant deforestation; lost Egyptian pyramids; and entire lost worlds) to providing a brilliantly simple way to prank the entire internet (see appendix a; b; c; etc). I started making my own maps with KML a few weeks after Earth’s release in 2005. For my master’s degree, I used Google Earth to build a virtual representation of a high-tech biological research reserve. Vint Cerf saw my work, which eventually led to a job on the Google Earth Outreach team, turning my passion for telling stories with maps into a career. So put aside your creeping dread of being surveilled from above at all times for a minute and enjoy the stunningly beautiful images that those cameras soaring 400 miles above us happen to capture, too.